As the effects will differ from person to person, there is no way to tell which ones you might exhibit. However, although a negative reaction is possible, the positive seem to far outweigh the negative on the whole. Erowid mentions the following reported effects in their Salvia FAQ. 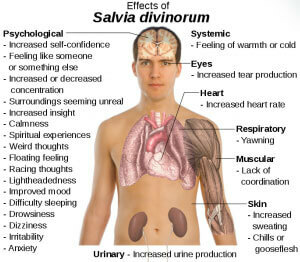 Studies offer limited information concerning long-term effects of Salvia divinorum on mood. Other k-opioid agonists are well known to cause dysphoria and “depressive-like” effects in humans, but there has been no such evidence for Salvia divinorum and salvia has even been used to treat depression. Baggott’s survey of 500 people with firsthand experience of salvia found that 25.8% of respondents reported improved mood and “antidepressant-like effects” lasting 24 hours or longer. Only 4.4% reported persisting (24 hours or more) negative effects (most often anxiety) on at least one occasion. This same survey found only 0.6% reporting an addicting feeling, and 1.2% reported strong cravings; both of which were deemed too few to “report with any confidence.” Unlike many other drugs, there are little to no reports of any withdrawal or hangover like effects the next day or anytime after. It should be noted that if smoked, Salvia divinorum takes on all the risks of smoking that any substance exhibits. These include cancer, emphysema, bronchitis, stroke and cardiovascular disease. If these are a concern to you, the chewing or drinking methods should be used. Studies have shown positive findings in using Salvia divinorum in the treatment of depression, as well as for a plethora of other diseases and addictions. In one experiment rats were given free access to cocaine, then to both cocaine and Salvinorin A (the molecule responsible for the main psychogenic properties of Salvia divinorum). Once exposed to an environment with both compounds, the rats stopped consuming the cocaine and went exclusively to the Salvinorin A. There is still much ongoing research and testing being done on Salvia divinorum and drugs derived therefrom, with focuses ranging from Alzheimer’s and schizophrenia, to even AIDS and cancer.